Unconfirmed sightings are increasing, but does this mean real bears or more Ravalli County hysteria? Officially there are no grizzly bears in the Bitterroot Mountains of Idaho-Montana or in the ranges to the east until you get about the Snowcrest Range. On the other hand, grizzlies are spreading out as their traditional food sources in or near Yellowstone die off — cutthroat trout, whitebark pine nuts. There is no doubt they are moving north, south, east and west; and this certainly pleases me because everyone I personally know who cares likes grizzly bears. It is certainly possible one or so has come as far west as the Sapphire Range (on the east side of Bitterroot Valley). It is also highly possible they have not, and reports are mistaken identity. The bears would have to cross some hostile country (attitudinally hostile). Suzi Foss, right-wing Ravalli County Commissioner is sounding the alarm as she did with all the wolves haunting the back alleys of Hamilton (at least until hunting season when none were to be found). Chuck Jonkel, a well known grizzly researcher and advocate does give more credibility to the rumors because he gives them credibility, as least according to a recent article. Central Idaho could support a large population of grizzly bears, and I hope they will, especially if they promise to chase around cognitively challenged Idaho politicians. 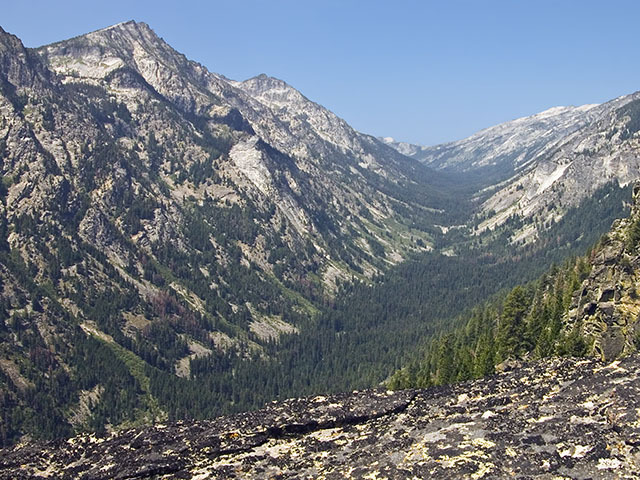 Reintroduction to central Idaho, which almost all Wilderness and backcountry, was planned until George W. Bush became President. So if the central Idaho grizzly management area is to have grizzly bears, the bears will have to walk there. In the past, from time to time, one has; but no sign of cubs has ever been found. It is male grizzlies that are the most likely to explore new territory, but females will have to follow if there is to be a recovery. maybe look at those folks, who live/own house below Horse Creek hotsprings, above woods creek, above painted rocks lake, they told me over breakfast at the west fork lodge,1996/97. that for many years, fed/state wildlife officers had been dropping grizzley bears off at the hot springs. way before anyone was really talking about the bears. these folks live indarby and keep ahouse down below the hot springs. I think this article was pretty well done. Foss and the Ravalli County commission are prone to hyperbole, but the bears are definitely moving toward the Bitterroot from both the GYE and NCDE directions. I don’t think it will be long before a grizzly ends up in somebody’s garbage in Missoula or Hamilton. Given the number of black bear problems in Missoula and Ravalli county I worry that we won’t have a handle on the garbage/pet food/attractant problem before more grizzlies start showing up. You might be right. The Bitterroot Valley has impressed me for a quite a while as place of unplanned development chaos — a terrible squander of good agricultural, forestry, and wildlife habitat beneath beautiful mountains to idea that everyone can build anything they want, anyway or anywhere, and damn the consequences to their neighbors’ property, the community (or lack thereof), and to the resiliency of the environment. The Valley is a big barrier, especially the stuff along U.S. Highway 93. Similar things are going on along U.S. 93 all the way to the Canadian border. I spent a couple hours on Google Earth today. It does like they (the bears) could avoid the valley by following the Idaho-Montana border into the depths of the Bitterroot. I also noticed there was more open space left in the Bitterroot Valley than the impression I get driving the highways and local paved roads. That isn’t likely in the foreseeable future; though in the past it was. I was just reading the “The State of State Science Standards” report for 2012. Idaho (along with Montana and Wyoming) were states that got Fs. I think this helps explain the public ignorance of wildlife, climate, geology, etc. As are result, policy is often made by people with poor education on the matter and presented to folks who have learned even less. Oregon, North and South Dakota, Nebraska and Alaska also fell at the bottom. I always wonder why we teach science in Idaho. Our politicians certainly never use much of it. If it doesn’t fit their agenda, it is called junk science. Hashing out the difference between the sophisticated bwrown science mask from the real face of green science is sometimes not that easy to do any more. Thus politics gets bogged-down in a sea of rhetoric and twisted language.Finding truth greatly challenged. It’s a dispersing clan of Bigfoots disguised as bears to avoid discovery. I wouldn’t be surprised if this was true. The Bitterroot is incredible country. It’s harder to see a bear, too because the Bitterroot doesn’t have as many open slopes (Glacier, for example). That said, I couldn’t wait to get out of there this year. I was hemmed in by several fires and the stretch from Darby to Florence was hellish thanks to the construction and non-stop development. Once you get off 93 though and past a lot of the garish private property with junk laying everywhere, you end up in some of the most beautiful, forested country in the lower 48. Missoula is such a great town, but that valley has some air quality issues for sure. Grizzly bears on the move . . yes I hope so. Bears move around in inexplicable ways. They have inborn four wheel drive, climbing skills, and are the ultimate stealth machines when they want to be. Their noses give them information we can only guess about and their motivations are generally to find a nice quiet place to live with lots of food. I was tracking a black bear I saw cross the road one day, and then I saw the bear again as he cut through a yard where a family was having a picnic and they never saw him, they didn’t’ see me either because I retreated as there was no way I could walk down the gravel like the bear just had . . completely silently. My wildlife camera which is set up about 50 yards from my house, in the city limits, recorded a black bear visiting last summer and no one in the neighborhood was aware of it. This bear was ten feet from my garbage can and compost pile but never touched it, as there is a huge patch of wild black berries of about 10 acres right near us. Bears quickly learn that if they are not seen at all, there is no commotion due to their passage. Unfortunately, bears, cougars and wolves have yet to learn about remote cameras and I am afraid that people who learn of their presence where they would not have been detected before will be fearful and kill, or have killed, animals who have learned to live among us with no danger to themselves or us. Further, if there is no food for them, they will be forced to seek food close to humans and the way humans in general view grizzly bears this can only mean dead bears . . I don’t think it is possible to educate enough people quickly enough that they can learn to live around bears safely so I still think that we should consider the idea of supplemental feeding in the manner of planting or providing natural food sources in habitats where they have been altered or ruined by the actions of man. I don’t mean hauling garbage out to the edge of town for animals to eat but to make sure there are remote food sources growing to provide a living for the animals. I mean, how can we expect animals to behave if they are starving? Many times I have sat with my spotting scope set watching the Southern end of the Sawtooths and often wondered about the possibility of there being any grizzlies up there and alot of country up there is roadless. But am sure if IDFG ever had the report of any they would quickly dismiss it. To be honest I have yet to even see a wolf here in Idaho and I try to spend as much time in the hills as I can. Seen lots of wolf tracks and heard one howl. I think it was 5 years ago me and my wife hiked the Little Queens river. This is my second time. I have hiked to Scenic Lake before. Also drove a jeep to Graham which is south Sawtooths. Any way we hiked in 5 miles and camped. The horse flies were as bad as they get. A small deer came in our camp and was kicking crazy to get flies off. I never see anybody on this trail. On the way back being in the shade and hiking close to the creek which is fairly loud, I spotted a bear, in the sun, going and eating on its way up the hill. The color was a light brown and this bear was huge. At least 500lbs or more. Large head and shoulders. We watch for at least 15 min. I have seen everything in the wild, from large herds of elk, moose,wolf,bobcat. I no size and distance well. This was a very large bear. I heard this area has the largest wolf population also. I did call the Fish and Game people and basically they don’t even consider my findings that it could be a Grizzly. They need expert in the field, dead or expert photos. In July of 2010 I was checking a power line which ran from Salmon,ID over Lemhi Pass to Grant Montana. Roughly 4 miles into Montana and 2 miles west of the Lewis and Clark Hwy I encountered a female Grizzly with a single cub. I surprised the pair on my atv at a distance of only 10 to 15 feet. After a short standoff with mommy, the cub turned tail and she followed. I have a BA in forestry and a minor in wildlife biology and I have no question this was a Grizzly I encountered. Although she didn’t have much of a hump on her shoulders, her pan face the color of her coat and 8 in claws gave her away. Not to mention she was the same size as the atv I was sitting on. So yes, I believe there are mating females in the BeaverHead Mountains, why wouldn’t grizzlys be in the Sawtooth range and even some lower Idaho ranges?